Mel Giedroyc recently co-presented The Great British Bake Off for the BBC alongside her long-time comic partner Sue Perkins, co-presented Let It Shine with Graham Norton and Gary Barlow and commentates for the BBC at Eurovision. Other TV credits include: The Sound of Music Live, Would I Lie to You?, Big Fat Quiz of the Year, 8 Out of 10 Cats and Richard Ayaode’s Travel Man. Mel will soon be playing Beatrice in Shakespeare’s Much Ado about Nothing at the Rose Theatre, Kingston. Other theatre credits include: Luce at Southwark Playhouse, The Rocky Horror Picture Show(Playhouse), Eurobeat (Novello), and New Boys. Rosalie Craig is currently performing in Jez Butterworth’s award-winning play, The Ferryman at the Gielgud Theatre. Other theatre credits include: Marianne Elliott’s production of The Light Princess, for which she won the Evening Standard Award for Best Actress in a Musical and was nominated for an Olivier Award, Rosalind in As You Like It, The Threepenny Operaand London Road – all for the National Theatre. Other theatre includes: City of Angels for the Donmar, Lady Macduff in Macbeth for Manchester International Festival, directed by Kenneth Branagh, Sylvia in the musical Finding Neverland and the title role in Miss Julie at Chichester Festival Theatre. Her film and TV credits include: London Road, Spooks, and Casanova. 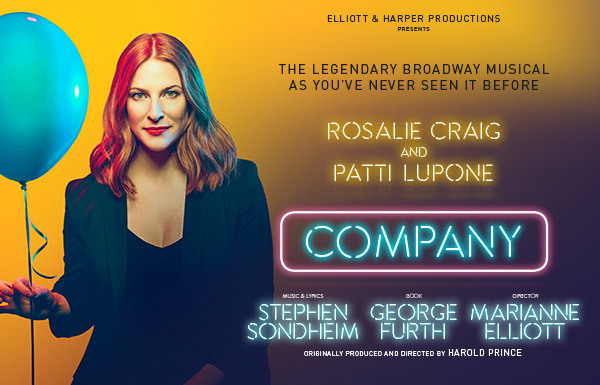 The producers for Company at the Gielgud Theatre are: Elliott & Harper Productions, Catherine Schreiber, Grove Entertainment, Jujamcyn Theaters, LD Entertainment, David Mirvish, Aged in Wood Productions/Ricardo Hornos, Bob Boyett/Tom Miller, Bruno Wang Productions/Salman Al-Rashid, Across the Pond Theatricals/ Trio Theatricalsand Ramin Sabi/Christopher Ketner.